While often overlooked in the traditional planning process, walking and biking are important modes in any comprehensive transportation system. Providing a safe, efficient and convenient route for non-motorized transportation can improve a community's economic development, access to jobs and transit. By ensuring these connections are made and maintained, the HATS region's transportation system will accommodate users of all modes, ages and abilities. According to 2012-2016 American Community Survey five-year estimates on commuting, the HATS region walks to work (3.4%) above the nation average (2.8%), but bikes to work (0.4%) slightly below the national average (0.6%). To illustrate the areas in which demand for bicycle and pedestrian facilities is highest, important destinations for walking and biking were identified. These destinations include retail commercial establishments, schools, neighborhood parks, employment centers, hospitals and transit nodes. A half-mile buffer, the generally accepted distance to measure walkability, was drawn around each destination and an overlap analysis was performed. Areas with more overlapping buffers are considered to have a higher bicycle and pedestrian demand and are shown in darker colors on the map. 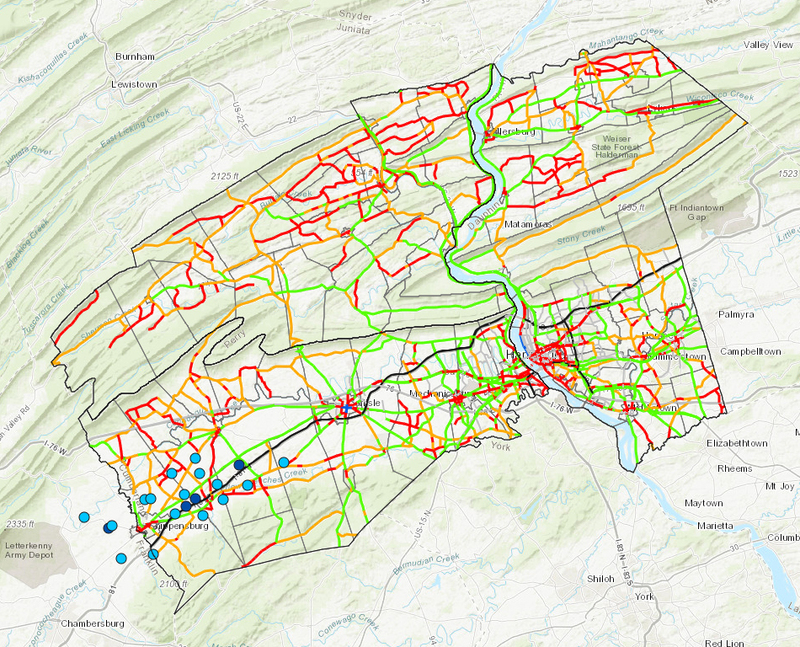 As expected, our region’s bicycle and pedestrian demand generally follows existing development patterns, concentrated around Shippensburg, Carlisle, Harrisburg and Hershey, with very little in western Cumberland County, northern Dauphin County and Perry County. The HATS region boasts many important bicycle and pedestrian facilities, such as the Capital Area Greenbelt, the Cumberland Valley Rail Trail and State Bicycle Route J. Additionally, in recent years, the HATS region has seen significant planning efforts and studies undertaken to identify the most appropriate and desirable routes to connect our communities for pedestrians and cyclists. The Eastern Cumberland County Trails Master Plan, Regional Bicycle Connections Study and the Cross Rivers Connection Study have all examined how best to accomplish this at the regional level, while more communities have developed their own municipal plans. To better coordinate the existing facilities with the planning efforts already completed, and to identify and begin filling in gaps, the Regional Bicycle and Pedestrian Backbone was developed. The intention of the Backbone is not to prescribe specific solutions or to supersede local planning efforts, but to provide a broad vision that connects the region’s places and communities by roads under HATS’ purview. Routes shown in green represent our existing major regional trails and facilities. This does not include every multi-use trail and pedestrian facility, but instead identifies those used for transportation as opposed to recreation. Routes shown in blue represent important routes identified in the region’s already completed bicycle and pedestrian transportation plans. These routes are concentrated along the Harrisburg to Hershey corridor and in the West Shore suburban communities. Finally, routes shown in red represent those that have not yet been subject to local study, but were identified by our region’s bicycle advocate community as an important regional transportation connection. Because the red “conceptual” routes haven’t been specifically studied, the exact route should not be considered final. Further study is needed to evaluate alternate routes. Volunteer Diana Sheppard records the number of bicyclists and pedestrians traveling through the intersection of 3rd & Market streets in Lemoyne during an October 2017 rush hour. Adopted in Fall 2014, the HATS Regional Bicycle and Pedestrian Study identified bicycle and pedestrian related issues and opportunities for the region, while providing a cohesive direction and specific steps to align the efforts of the many communities and stakeholders. The development of the study was driven by significant public outreach, including multiple surveys, stakeholder meetings and targeted interviews. The end result was a document articulating a vision for making the region more walkable and bikeable, and identifying goals and strategic actions required to achieve it. To access the full document of the HATS Regional Bicycle and Pedestrian Study, please click here. 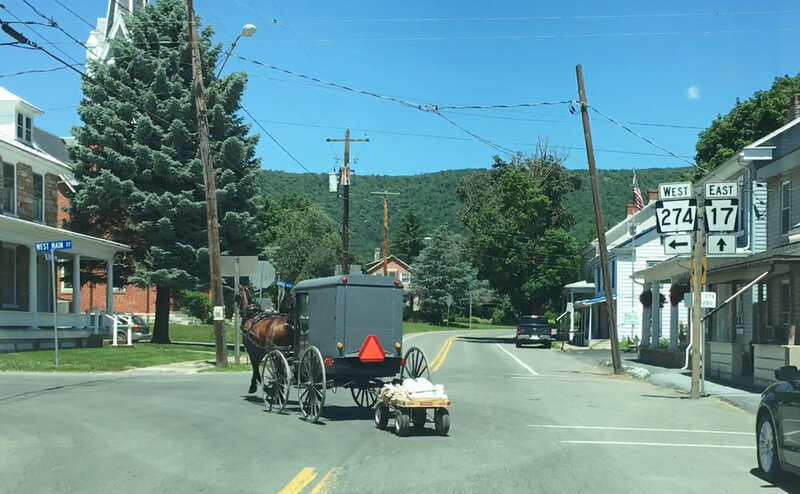 All three counties in the HATS region have significant concentrations of Amish and Mennonite populations, with many of the residents using predominately non-motorized (pedestrian, bicycle and buggy) travel. In an effort to better understand the areas where these populations are focused and their key transportation issues, a series of outreach meetings were held to solicit their input. The map at left illustrates the areas where these populations are focused. Their primary travel routes have been highlighted. The map also shows the width of shoulders on all of the region's roadways, which is particularly important in areas with heavy buggy and non-motorized travel. When shoulders are lacking or narrow, these modes must mix with traditional vehicular traffic. Other key safety concerns include vertical curves where motorists often approach buggies rapidly after cresting a hill and/or roadways and driveways that access major routes with limited visibility close to hills or other obstructions. Lastly, Plain Sect residents have expressed concern about the lack of awareness of the presence of buggies, bicycles and pedestrians and have indicated that more signage may be warranted in key areas where they travel most frequently. HATS will hold periodic outreach meetings with the Plain Sect community to refine the areas of concern, provide timely information on construction projects and potential detours, and provide coordination between PennDOT and the community to incorporate improvements such as shoulder widening, vertical curvature reduction, and/or signage in areas with the greatest safety issues. Virtually every transit trip involves the user walking to and from the bus, making the quality of the pedestrian environment around bus routes and stops vitally important to the viability and success of the transit system. In addition to pedestrians, bicyclists are becoming increasingly important transit users. Improving accommodations at existing transit stops and facilities, while also working to integrate them into future stops and facilities, will increase ridership and make investments by transit providers, like CAT’s bikes-on-buses program, more beneficial. Maintain communication with the Plain Sect community to refine the areas of concern, provide timely information on construction projects and potential detours, and provide coordination between PennDOT and the community to incorporate improvements such as shoulder widening, vertical curvature reduction, and/or signage in areas with the greatest safety issues.